I really liked what she wrote. According to CaGEL* (Page 1073), what she wrote is not a clause but a noun phrase (NP). The reason I believe is that the head of what she wrote is not the clause she wrote but the noun what. That is, there is a clause in there but it's just that the clause is not the head of the entire thing in bold. That said, I'd like to know whether the clause (she wrote) is a modifier or a complement of the head noun (what). 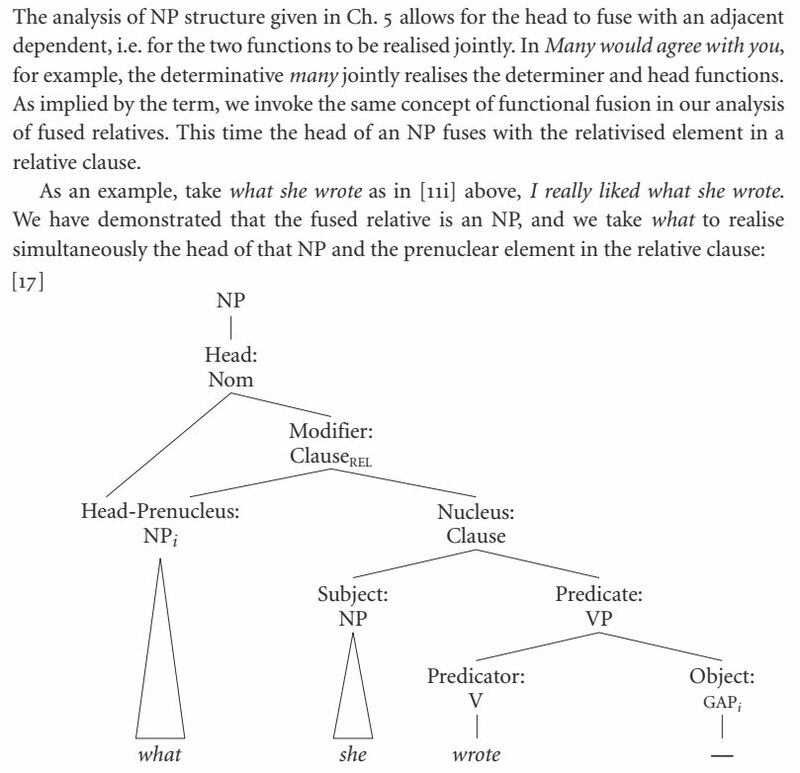 I don't object to this tree diagram itself, because any relative clause is a modifier (not a complement) of an antecedent, and because in a fused relative construction with what, the relative clause itself comprises the 'prenucleus' part of what as well as the following clause (e.g., she wrote). That said, I'd like to know whether the following clause (she wrote) is a complement or a modifier of the fused relative word (what) in its entirety, which question is not answered in the above tree diagram or anywhere else in CaGEL. I suspect that, being a fused relative, what is not just any antecedent but is a fusion of an antecedent and a relative word, and therefore that what can be construed as licensing she wrote. All in all, is she wrote a complement or a modifier of what? After the edit, my question does not go against CaGEL. > That said, I'd like to know whether the following clause (she wrote) is a complement or a modifier of the fused relative word (what) in its entirety, which question is not answered in the above tree diagram or anywhere else in CaGEL. The term modifier is normally reserved for non-head constituents of a Noun Phrase, while complement is normally used for a mandatory non-NP constituent of a clause licensed by the particular verb or verb sense. So if you prefer, it's a modifier. But I don't think the distinction is of much importance. If you are working on a Linguistics paper, just see what classification works best with your overall analysis and then try to see where the weight of evidence lies. If you have access to Dixon's Basic Linguistic Theory, sec. 17.5.3 has a good, brief discussion on fused relative clauses and some references for further reading. Not the answer you're looking for? Browse other questions tagged relative-clauses relative-pronouns or ask your own question. Can a word function as a relative adverb and a relative pronoun simultaneously? Is 'who' here a relative word or an interrogative pronoun? Is 'why' a fused relative word or an interrogative word in “This is why we do it”? What exactly falls under the label of “complement”?